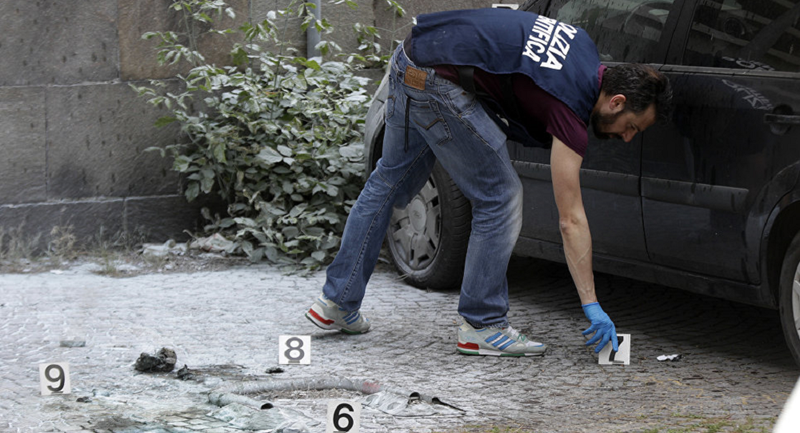 A homemade bomb exploded on Wednesday night near an office of the ultra-right Italian CasaPound party in the city of Trento, the press service of the party told Sputnik. The blast damaged the entrance to the building, smashed the windows and knocked out the door. The organizers of the explosion wrote on the office wall: "The only correct voice is antifascism forever." Reacting to the incident CasaPound representative Filippo Castaldini stated: "This is another act of those who have nothing more to offer, it should have interrupted our activities, but this will not happen." He added that a similar attack had taken place four years ago. The anti-terrorist unit of the police Digos arrived at the scene. The investigators are working on a version of the involvement of left-wing radical activists in the incident. The CasaPound party is infamous for its ultra-nationalist views and named after American poet and Fascist sympathizer Ezra Pound, who actively denounced Jews and supported the power of Benito Mussolini and Hitler and moved to Italy in the 1920s. ​Later, Pound was arrested by US forces, charged with treason at the end of the World War II, and spent many years in a psychiatric hospital.